Amino acids can be defined as carboxylic acids that contain an amine function. Alpha carbon, Cα is directly bonded to the carboxylic group, to an amino group, to a group (R) and to an hydrogen (H). If the amine group of amino acid and the carboxyl group of a second amino acid react, a bond is created uniting the two amino acids called peptide bond. An amide has a C–N bond. It can be formed by reaction of a carboxylic acid and an amine. The peptide bond (the C=O and N-H) all reside in a single plane and it is rigid. Rotation is allowed only to the bonds involving a carbon atom. 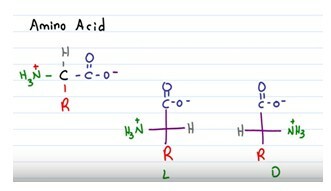 Cα is a chiral center, it makes the amino acid chiral. A molecule is chiral if the molecule and the mirror image is not superimposable, like your hands. Chirality induce optical activity in a molecule. Amino acids can be defined as carboxylic acids that contain an amine function. Every amino acid contains a carbon (C), called an alpha carbon, Cα. This atom is directly bonded to the carboxylic group, to an amino group, to a group (R) and to an hydrogen (H). R group is unique for every amino acid and it is what distinguish an amino acid from another. If the amine group of amino acid and the carboxyl group of a second amino acid react, a bond is created uniting the two amino acids called peptide bond. The resulting molecule is an amide, with a C–N bond. It can be formed by reaction of a carboxylic acid and an amine. This reaction generates a dipeptide and a water molecule is released (a hydroxyl (OH) leaving the carboxyl group and the hydrogen atom from the amine). The peptide chain may be extended to incorporate three amino acids in a tripeptide, four in a tetrapeptide, and so on. Polypeptides contain many amino acid units. 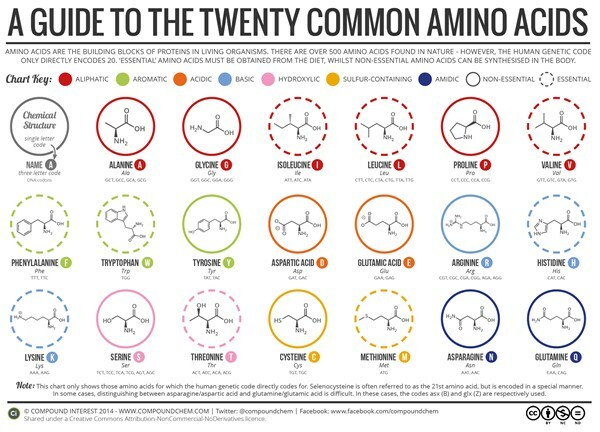 Amino acids are the building blocks of proteins. Every protein is a polypeptide containing more than 50 amino acid units. Since the bond between the carbonyl carbon and the nitrogen has a partial double bond character, the rotation of the peptide bond is not possible. This means that the peptide bond (the C=O and N-H) all reside in a single plane and it is rigid. Rotation is allowed only to the bonds involving Cα. There are two possible conformations of the planar peptide bond: in the trans configuration, the Cα atoms are on opposite sides of the peptide bond and in the cis configuration, the Cα atoms are on the same side of the peptide bond. Generally the cis-form is about 1000 times less stable than the trans-form. Cα is a chiral center and molecule that has a chiral center are called chiral molecule. A chiral molecule is not superimposable on its mirror image. The mirror images of a chiral molecule are called enantiomers or optical isomers. Chirality is the name of this property of some molecule (the molecule and the mirror image is not superimposable, like your hands) and refers to a molecule that has optical activity, so amino acids are optically active molecules. It is generated from the presence of an asymmetric center, like the chiral center. Chirality is an essential consideration when discussing the stereochemistry in organic and inorganic chemistry. The concept is of great practical importance because most biomolecules and pharmaceuticals are chiral. From the point of view of the observer, dextrorotation refers to clockwise rotation, while levorotation refers to counterclockwise rotation. Individual enantiomers are often described as either right-handed or left-handed. An amino acid with the dexter configuration (dextrorotary) would be named with a D prefix. An amino acid having the laevus configuration (levorotary) would be prefaced with a (-) or L.
It is possible to determine if an amino acid is the D or L enantiomer drawing it on paper like it would be flat (Fischer projection). The molecule need to have the carboxylic acid group on top and the side chain on the bottom. The amine group will not be at the top or bottom. If the amine group is located on the right side of the carbon chain, the compound is D. If the amine group is on the left side, the molecule is L. For drawing the enantiomer of a given amino acid, simply draw its mirror image.